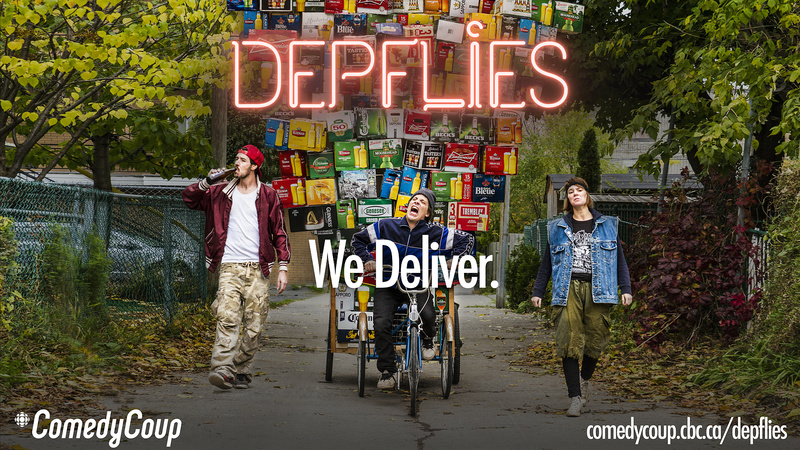 Special delivery from the Dépflies team! 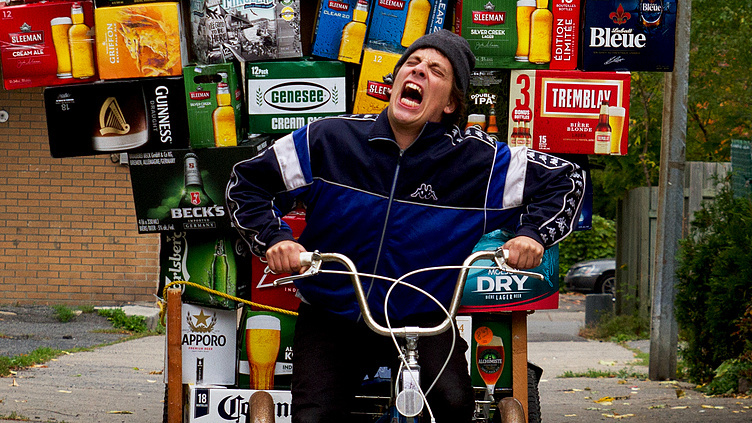 When I was a teen going to Quebec to get my beer I always thought it would be cool to ride my bike back across the bridge into Ontario with about 50 cases of beer on the back. Maybe I wouldn't get far but the picture would be worth the risk. This poster did it for me. I can't wait to see more. Keep going guys you ROCK!!! Peter delivers for the dépanneur, sometimes at epic proportions. Peter's declaration that he and the rest of the DÉPFLIES crew are living in the Belle Époque 2 perfectly reflects his utopian dream of a prosperous Montreal where the arts and liberty flourish. His optimism is both heartwarming and hilarious in light of his situation a delivery driver for a family-run dépanneur in St-Henri. 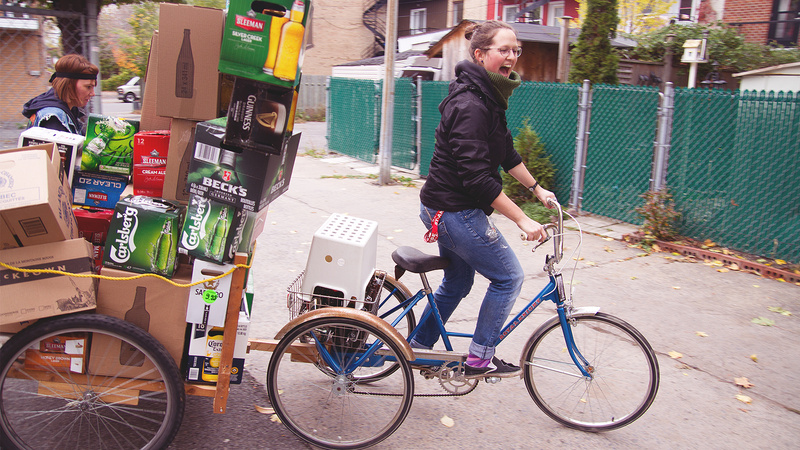 Set Designer Marie-Michelle Castonguay going for a spin on the dépanneur delivery bike that she created for our Poster 1 DÉPFLIES key art photoshoot. Every episode of DÉPFLIES also includes a zine. What is a zine? It's a small magazine, an indie-rock piece of literature. Every year www.expozine.ca unites 1000s of people in this subculture. 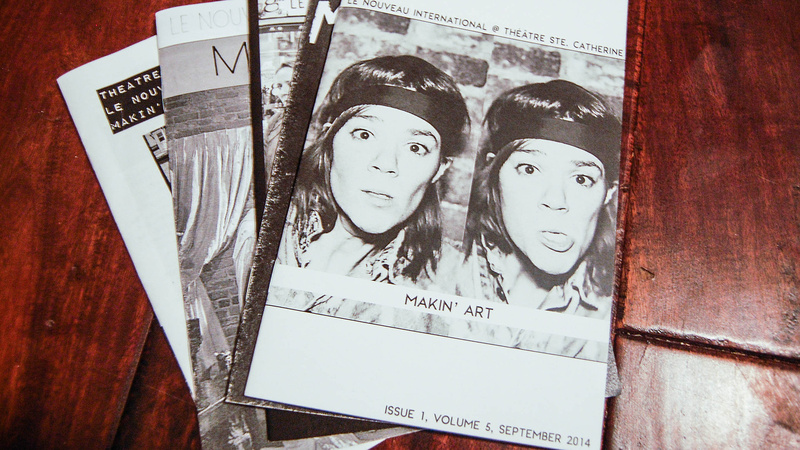 Le Nouveau International, the arts company behind DÉPFLIES, produces a bi-monthly, bilingual zine called "Makin' Art" that you can pick up at Théâtre Ste Catherine in Montreal or online @lenouveau.org. This type of edgy literary art is an integral part of the overall artistic vibe of DÉPFLIES. Tuna is the chicken of the sea. Someone wanna tell me, how I could have picked B? A is clearly the better poster! Poster A is very strong. Great story told in a single image. The pyramid of "I hope it don't fall" beer boxes, and that bike! Lol. Very creative Poster A! Loved the facial expression of the delivery guy. It conveys his pain and determination to deliver at all cost. You then look at the boxes and can't help but laugh. Great expression in poster A and it got my vote. Love the 'we deliver' message and the struggle to do so! Your concept is always fresh, insightful, bright, and right on the mark! Great job! Really like poster A and realized the beer cases went to the very top of the photo! Made me laugh. You guys are bringing it each week! Great job! Great talent! More, more, more! Top 15 here you come! What a face! The comedy you guys present is the best of the bunch! Love the energy, colour, expression and laid back saunter of the actors! Makes me laugh! Thanks for all your work and keep it up! You'll make it to the top! K so, number one, you're on your way to success here. Number two, "number one" again! Slip off the pedal and land on a sensitive spot? Yippee Kai EH, Depflies team! I want to live the Depflies life! REVOLUTION, eh???!!! I went with Poster A because it is an accurate depiction of Montreal life. Good stuff guys! that's hilarious!! It's never too late to live your dreams! poster A all the way... good job c'est Bon! Poster A, Love the background images and the people. Great job on poster A! Definitely poster A. Catchy, funny, colourful; makes a person want to find out more! I really liked Poster A, just looking at it makes you laugh,,,good comedy for sure. You all seem to have great talent and looking forward for more from you guys. Have also passed along this site to numerous friends. Good luck, you will make it to the top 15 for sure!! Great job on the poster and not only did it catch my eye but made me laugh as I examined the content. You're creative and talented for the show and the marketing! Tremendous! I chose Poster #1 because it is such an evocative photo, and after watching the Week ! trailer I find this sums up the spirit of your show in one image. Especially the outstanding work of Ms. Castonguay in creating the bicycle itself (and you guys for letting us know who she is! ), this image won in my eyes. Otherwise, I think it's a situation where I would love to see the slogan on Poster #2 used with the image in poster #1. I just think it would come to fully express our lives in modern society, especially when backgrounded with one person doing the work of three. J'ai vraiment hésité... mais c'est la giga montagne de caisses de bieres qui m'a convaincue! The gentleman on the bike is so so handsome. Poster A. It gives me that good feeling that art is coming at me. 2 estis de beaux posters ça. C'est de l'art su'a coche ça! Keep on rap-rockin' on! Love both posters but have to vote for poster A. The facial expressions are priceless! Great job and looking forward to more and more from you guys! Really have comedy nailed and can't wait to see you on CBC television!!! Have my vote!! Although the chick in poster B is pretty darn good looking, the Poster A captures the extent of what this crew can do. Both posters are great! My vote is going for poster A though as it seems to ensnare some of that great comedy you guys are going for. I noticed it is missing the accent on the E though, but it's still a great poster. Thanks for taking into account what I said in my previous comment, I appreciate that you guys read your fans comments. Thanks so much for your feedback Christina, the accent is going back in, that was a last-minute crunchtime error on our part we shall remedy. Excited to hear your comments in the future! Poster screams comedy, would have liked more cast in it, but it clearly is funny. I really like poster A pretty hilarious and I like how the optional images shows how you carried it out! I really like these posters and I like the effect you did with the title. Thanks Max! Rooting for your project too! LOPVE IT! This poster speaks VOLUMES without uttering a single word. haahahaha Peter putting his heart into getting this impossible delivery done... the other two just struttin'. Love it guys! Hilarious. AWESOME ART! AWESOME ART! AWESOME ART! I can feel the emotions coming out of this beautiful piece of art! Love the energy. I want the twelve pack of the Tremblay delivered into my tv right now!!! Put this on CBC !!!!!! !